The AGE Reader assists physicians in focusing treatment on patients with the highest risk of complications. This includes patients suffering from diabetes mellitus, renal failure but also acute disorders like acute coronary syndromes and sepsis. The non-invasive AGE Reader measurement adds value particularly to the classic risk factors that predict the cardiovascular risk of diabetes patients. The AGE Reader measurement reflects the glycometabolic memory which is not covered by the classic risk markers. Therefore it adds clinically relevant information to the cardiovascular risk prediction for diabetes patients. Reflects the vascular damage of a patient. Identifies diabetes patients at risk of developing cardiovascular and/or micro-vascular complications. 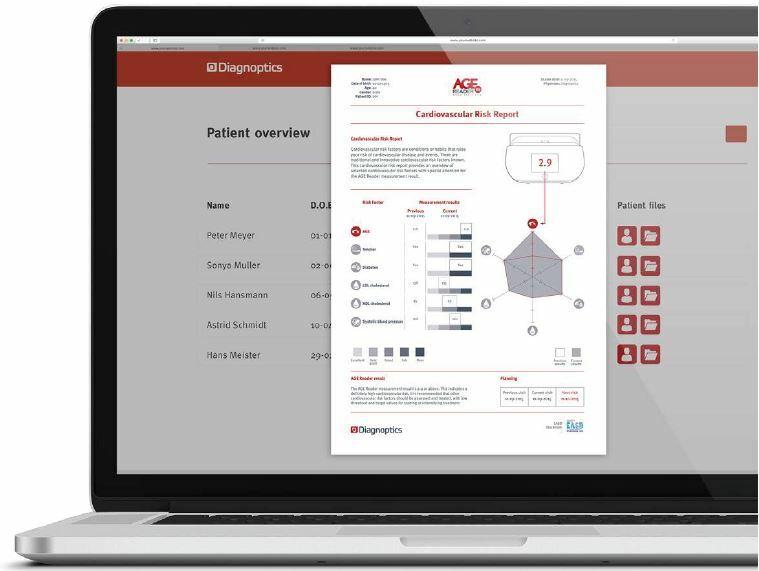 is a cost-effective assessment tool that adds clinical value to conventional risk engines. A motivation tool for patients. Assist in clinical decision making about intensifying or changing treatment of diabetes patients, such as switching to more intensive diabetes treatments or multiple therapy. Assist in clinical decision making about the cut-off levels for classic cardiovascular risk markers. Identify patients with an increased risk of developing complications that were identifiable based on the classic cardiovascular risk markers.